maquis and Mediterranean batha in the Meron mountain range". Name of supervisor: Prof. T. Dayan, Tel Aviv University. 2005-2007 Faculty of Life Sciences, Tel-Aviv University, Teaching assistant. 2008 -2010 Faculty of Life Sciences - Nature Campus Project, Tel-Aviv University, Teaching Coordinator. 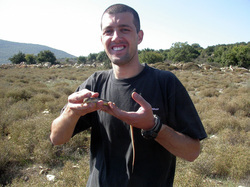 2008- Natural History Collections, Tel-Aviv University, Technical assistant. 2010- Faculty of Life Sciences, Tel-Aviv University, Laboratory technician. 2007 - 35th Annual Meeting of the Israel Society for Ecology and Environmental Quality Sciences, Weizmann Institute of Science. 2007 - 44th meeting of the Zoological Society of Israel, Achva Academic College, Israel.